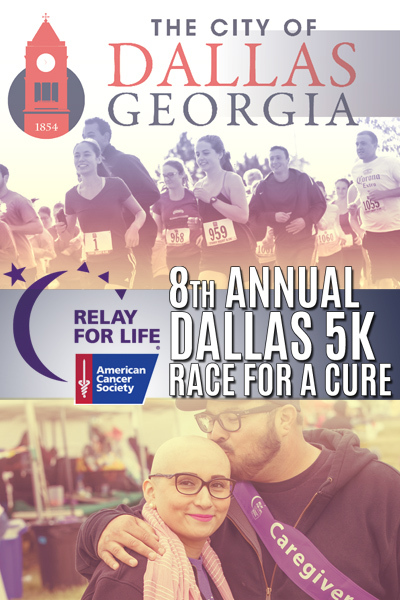 JOIN US for our 8th annual Dallas 5K Race for a Cure on Saturday, April 27th. Registration and Check-in starts at 6:45 am, the race will begin at 8 am. Immediately after the race join us for Pickers Day at 10 am then CITYFEST (LIVE Concert) beginning at 6 pm with live music well as vendors, food trucks and activities for kids. Concert featuring "TBA". The Race Proceeds will benefit Paulding County Relay for Life and The American Cancer Society. To Register as a Runner please click here. Sponsorship Opportunities Available: Company exposure to 100’s of participants.